ROBIN – ARMED AND DANGEROUS! With great fictional characters there is often a prop that becomes associated with them that helps define their very nature. Superman has his Kryptonite, a name that screams science fiction. Wonder Woman, in her heyday, had her magic lasso which evoked fantasy adventure (does she even have that lasso anymore?). Yet for Batman, to me anyway, the item that always comes to mind is a gun. Detective Comics #32 – Batman blows some vampires away! In fact, in his earliest incarnation, the gun was a “cool tool”. 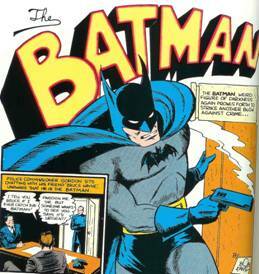 One can see Batman holding or using a gun in Detective Comics #32, 33, 35 and Batman #1. By Robin’s introduction, however, this dark demeanor would soften, and Batman would be seen smiling happily during battle. Only in more recent years has the gun resurfaced in a pivotal manner, from the classic Year Two story arc, to Batman’s most recent temptation in Infinite Crisis #7. It’s always stirring to see him with a gun in hand, only because you know that Batman would never, ever kill with that weapon – and if he did, if the creators actually pulled it off, it would signify the end of the character. There would be no going back. Tension built on finality. So, Batman has his gun. It’s all right there. 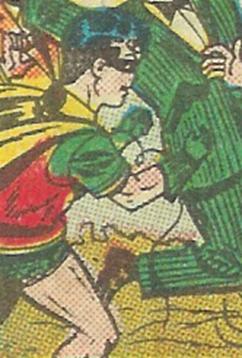 To the left, Robin is seen catching a gun dropped from the prone hand of a beaten up crook. 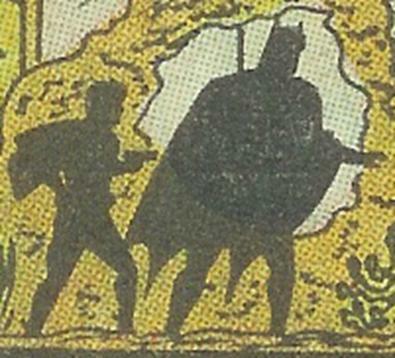 And to the right we see Robin promptly shooting Batman in the back! Oh, the folly of youth!! 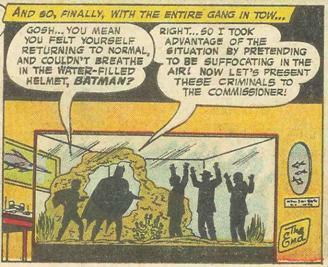 Okay, so Robin never did pull the trigger, but the image alone is strange enough, particularly when you realize that the issue is from the late 1950s era of social conservatism and the all mighty Comics Code Authority. Then again, this was also an era where children were encouraged to play with replica rifles and to join dad on hunting trips, etcetera, so maybe it wasn’t as uncommon a sight to see a 12 year old brandishing a .45? I believe that even by 1950s standards, this would be an oddity. Weird, isn’t it? 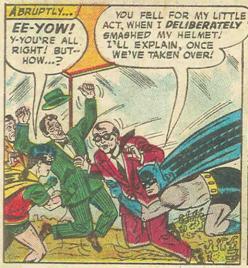 A gun toting Batman is one thing, but a gun toting Boy Wonder? Now that is creepy! Batman, Robin, Detective Comics and all related characters and stories are TM and © DC Comics.